Guest Conducting - MusicMaestro LLC. Honor Bands & Orchestras, Community Bands, Music Camps, Clinics and Adjudication for HS/MS Bands and Music Programs. ​Mr. Hodgson is a Conn-Selmer Educational Consultant and an active guest conductor for high school honor bands, community bands and summer music camps; a high school and collegiate band clinician and guest speaker; and is the Head Director of an annual three week summer European music tour of 150+ students performing in 6 countries. As a clinician, Mr. Hodgson presented at the International Midwest Clinic in 2007 on National Board Certification and the Music Certificate and presents numerous sessions at state and regional conferences and for school district professional development. He has guest conducted honor ensembles in NJ, PA, CT, AK, MD, NY, AL and Europe. Mr. Hodgson has held the conducting post of the South Jersey Area Wind Ensemble since it's founding in 1997. 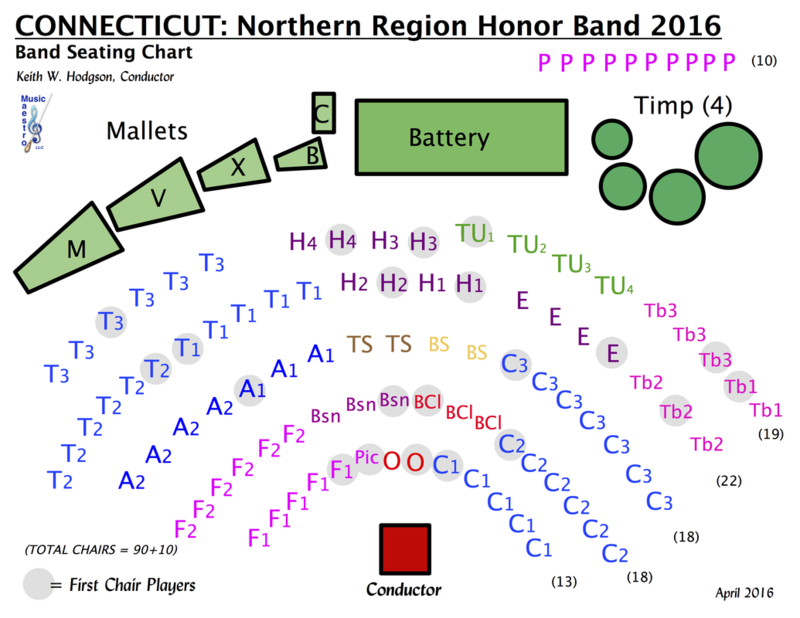 Performing at the NJMEA State conference in 2000, 2005 & 2011 and the Association of Concert Band's National Convention in 2014 and 2019. 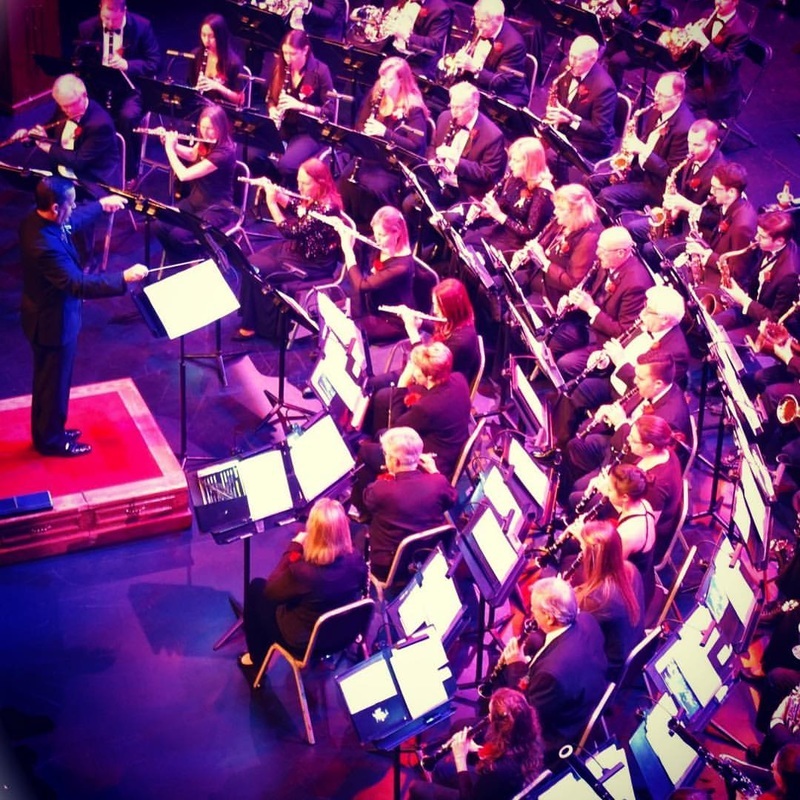 The SJAWE actively performs to sold out ​community concerts 4-5 times each year, has commissioned 15 works for wind band, and collaborates with guest conductors and a side by side program with 50+ nominated high school band students. 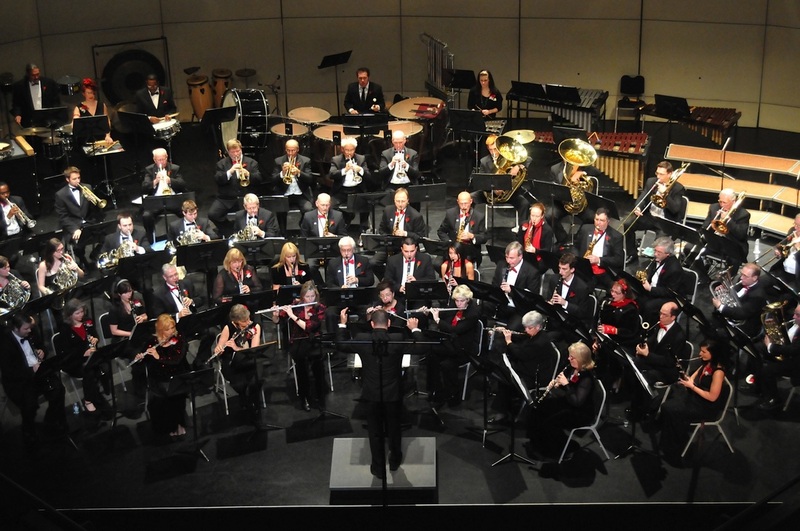 The SJAWE was the only 2006 recipient of the Sudler Silver Scroll Award by the John Philip Sousa Foundation recognizing outstanding community concert bands in North America. 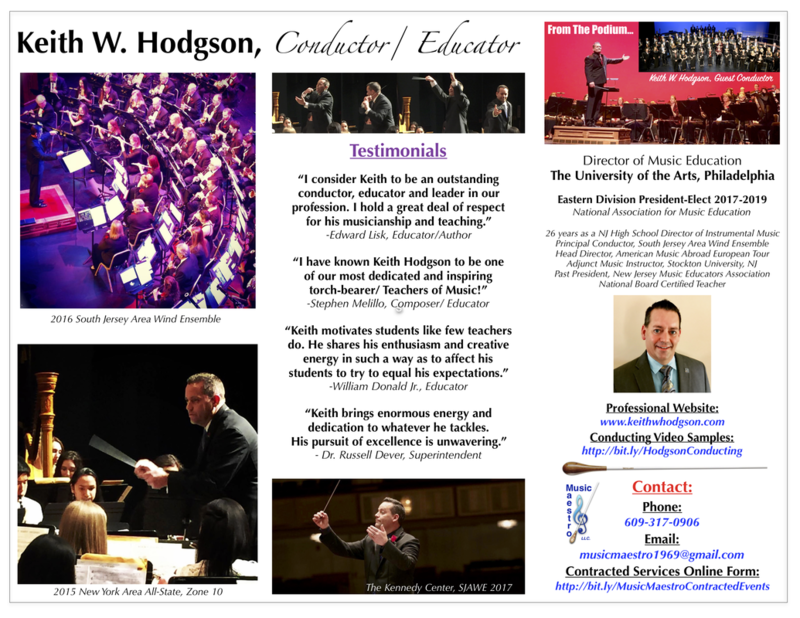 Mr. Hodgson is an Assistant Professor and Director of Music Education at The University of the Arts in Philadelphia. As a high school band director for 26 years, Mr. Hodgson was a Concert, Jazz, and Marching band director of a well-rounded and successful music program. The Mainland Regional HS Wind Ensemble has appeared at the NJ State Gala Band Concert on 15 occasions. Mr. Hodgson is a Past President of the New Jersey Music Educator's Association, a National Board Certified Teacher, a Grammy Nominated Quarter Finalist, recipient of the 2014 NJ Governor's Award in the Arts for Leadership in Music, and holds a Master's Degree in School Leadership with administrative certificates. He was the 2016 recipient of a Distinguished Service Award by the NJMEA Executive Board, nominated to the 2016 class of the American School Band Directors Association and invited to the Conn-Selmer VIP Program. He also currently adjudicates for WorldStrides Heritage Festivals and a contributor to a new edition of a Band Curriculum Guide for the American School Band Directors Association. 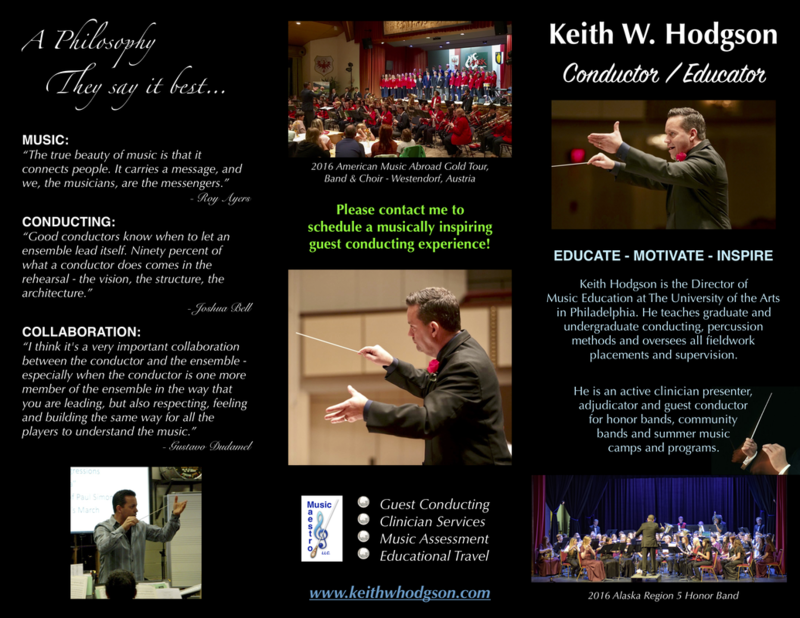 To contract Keith Hodgson for Guest Conducting, Sessions or Clinics... please fill out the online form below. - Symphonic Band Director - Marching Band Director (13) - Chamber Ensembles Dir. I am the founding conductor of an adult community band in New Jersey. The community band plays an important role in the lives of many people. 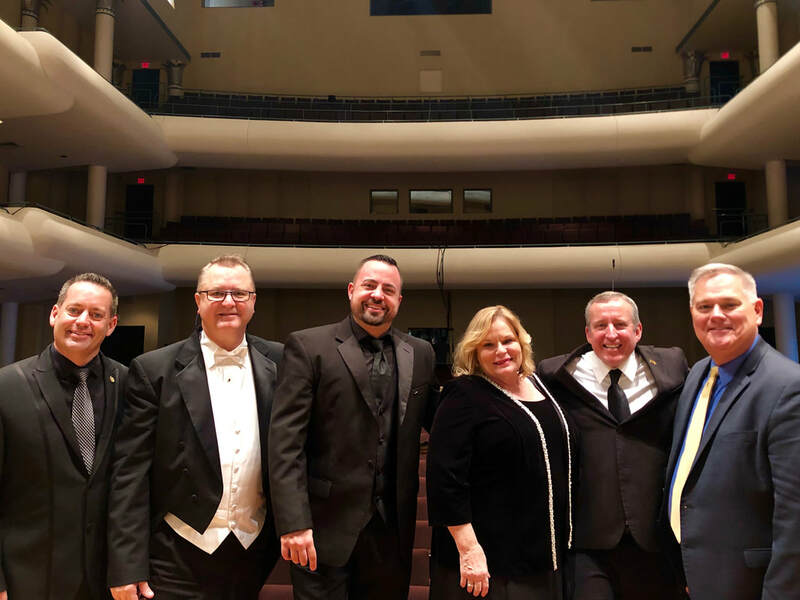 The SJAWE serves the needs and desires of adult musicians from all over South Jersey, the performances enrich the lives of local audiences and numerous student musicians are inspired through our annual Side by Side program. Head Director since 2009. I lead a three week summer music tour of 150+ student musicians performing as a Concert Band & Concert Choir through five countries in Europe. My role teaching students to be musical ambassadors to European audiences is the best thing I do in my professional career. CONDUCTING VIDEOS... Here on YouTube. - American Jubilee, Charles Booker Jr.
﻿I enjoy the musical theater and have conducted over 40 broadway musicals on the high school stage over the past 25 years. Additionally, I frequent Broadway and have seen all of the shows I've conducted and many more! All of the 50+ shows in the slideshow to the right are musicals I have conducted and/ or seen on Broadway.